Once you have evaded paying taxes and haven’t filed tax returns, criminal law will apply to you, warns attorney on the celebrity’s woes. 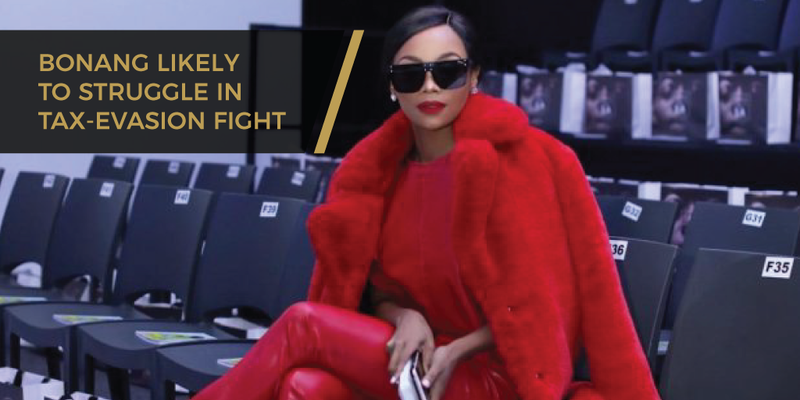 Team Bonang Matheba’s optimism on the outcome of engagements with the taxman on the television personality and businesswoman’s tax woes could come to nothing, a tax attorney has cautioned. Jean du Toit, tax attorney at Tax Consulting South Africa, said Matheba will unfortunately have to let the law run its course. “We have noted from the media that Matheba’s team is engaging with Sars to correct her previous non-compliance. Unfortunately, this may not be enough and Matheba will have to let the law run its course. “Given that this is a criminal matter, the mitigating factors are underlined by criminal law, as opposed to the Tax Administration Act [TAA],” he said. Matheba, 31, is facing fraud charges after she allegedly failed to pay personal tax between 2008 and 2017 and company tax between 2014 and 2017. Last week, the Johannesburg Commercial Crimes Court granted her a postponement until November 27, for her to file representations with the National Prosecuting Authority. Du Toit said insofar as Matheba’s failure to submit returns, the TAA criminalises failure to submit returns and may attract a fine or imprisonment of up to two years. He said the Act also criminalises tax evasion and may attract imprisonment of up to five years. Du Toit said ignorance was never a defence and it would not spare Matheba. He said that, given that this was a criminal matter, the mitigating factors were underlined by criminal law, as opposed to the TAA. Du Toit, however, lamented that it appeared taxpayers were not always treated equally, saying some, such as Matheba, faced the consequences of non-compliance, while others were left untouched. “We have made submissions on this very aspect to the Nugent commission, where we highlighted that it may negatively impact taxpayer morality if there is a widespread perception that certain taxpayers are given favourable treatment. “We hope that this may be addressed in the commission’s final report,” he said. The Nugent Commission is probing Sars’ operations during Tom Moyane’s tenure as commissioner. Matheba’s manager, David Phillips, could not be reached for comment. Is the compliance rate on the increase or not? Sars: For tax season this year, which is the period in which individual taxpayers are required to submit their personal income tax returns, Sars received 5.7 million tax returns, which is 2% more than last year. What are the penalties of not complying with tax laws? Sars: If we are late with our individual personal income tax returns, administrative penalties ranging between R250 and R5 000 are applied. The Citizen: What long-term consequences are there for being guilty of tax evasion? Sars: When tax crime is detected, an investigation is launched by Sars and the case is escalated to the National Prosecuting Authority for prosecution. The Citizen: How does one avoid being on the wrong side of tax law? Sars: Find out which taxes apply to you. This can be done at a Sars branch or the contact centre. Tegister for the taxes that apply to you and file your personal income tax return if you earn an income above the tax threshold of R350,000 per year– only people who earn above this threshold are required to submit a personal income tax return.